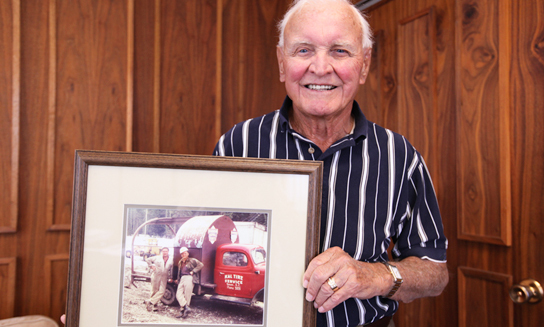 Tom Foord built Kal Tire based on his fundamental belief that the ability to deliver top quality products at a fair price, backed by superior service, will produce customer satisfaction. It’s what has come to be known as “True Service”. When Tom started the business in 1953, his customers always appreciated the way he provided excellent service. To this day, our customers still appreciate the service, product, prices and guaranteed satisfaction provided at more than 250 locations throughout Western and Central Canada. Kal Tire, a wholly-owned Canadian company based in Vernon, BC, is Canada’s largest independent tire dealer. Kal Tire stores in Canada operate by a functional zone management structure that has flourished by focusing on customer service and teamwork. The real difference at Kal Tire is our people. Kal Tire team members are the most caring and knowledgeable problem solvers in the business. Our long-time involvement in the tire industry has given our team the training and experience to deliver True Service. Whether it’s mine haulage tires, off-the-road logging, industrial, fleet transportation, farm or personal use vehicle tires, Kal Tire has the expertise and products to be the leader in the tire sales, service and retreading industry. Over 5,000 Kal Tire team members are committed to exceeding the customer’s expectations with the best technical skills, quality products, competitive prices and exceptional service available anywhere. For 65 years, Kal Tire has expanded steadily and the Kal Tire stores across Canada service both retail and commercial customers. Kal Tire is the largest commercial tire dealer in North America. Our Mining Tire Group is a global leader operating on more than 150 mine sites in 17 countries. Additionally, Kal Tire has 10 retread facilities, as well as 4 OTR retread plants and 4 warehouses. Retreading of industrial and commercial tires is an important part of the business; Kal Tire is Canada’s largest retreader of truck tires using the quality Bandag process. Kal Tire sells and services Bridgestone, BFGoodrich, BKT, Carlisle, Centennial, Continental, Firestone, Goodride, Michelin, Multi-Mile, Nitto, Nokian Tyres, Nordman, Pirelli, Sailun, Sumitomo, Yokohama and Bandag retreads. These manufacturer / suppliers enable the company to stock and supply a wide range of tires to fit even the most exotic sizes. “If we sell it….we guarantee it!” is a sign you will see in every Kal Tire store. Our Customer Care Plan for personal use vehicles features free installation, free tire rotation, free flat repairs, lifetime balancing on original assembly and a 30-day, no hassle replacement guarantee. At the heart of Kal Tire is a culture steeped in values. Seven guiding principles known as the AIMS provide a roadmap for the 5,000+ team members for how business will be conducted. Included in those AIMS is a commitment to exceed customer expectations as well as a commitment to ensure the career of every Kal Tire team member is supported by quality leadership, training and opportunities for advancement.